Step-by-step visualization of innovation solutions with short, mid, and long-term strategies, giving perspective to the long-term vision while clarifying key decision points along the way. There is greater uncertainty in pursuing innovative offerings, and traditional evaluation processes become less relevant. Incorporating strategies along an innovation roadmap reduces uncertainty associated with the development process and evaluation of innovative offerings. For organizations looking to improve, an overnight solution is unlikely and/or impractical. 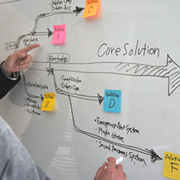 We work with firms to build roadmaps for developing their organization's long-term innovative capabilities. In order to coherently develop and manage brand image, it is critical to visualize the process and objectives along a structured roadmap.